Can't wait to see final result and listening ITB screams. Oh I forgot mean to, if you need AE86 hatch parts, I'm breaking my AE86 into part (advised at part classified). Give me shout if you need it. I already bought all the parts i need but i'll let you know if i need anything else. Maybe i could get some interior parts but who needs an interior anyway. Woah that came out so nicely! uuuuhlala. Another AE. And if I recall those other cars you had/have. I think will be a good one. Hell yeah, Beams all the way! Thanks mate! # Soju : Woah that came out so nicely! # radcoon : uuuuhlala. Another AE. And if I recall those other cars you had/have. I think will be a good one. Thanks man, it's already going pretty well now so i'd say you're right! First up - the good ol' Mk2. I assembled the SR20 and kinda installed it, for now i only adjusted the mounts so the engine is in place. Before that i threw on the clutch, flywheel, gearbox and exhaust header from the VE and made some measurements for the gearbox. And i already started with mods when the swap isn't even complete lol. I installed a GReddy intake that i got from Skip, i might use some more parts from the VE short block but that'll have to wait. I must say it fits pretty nicely, now i just have to connect all the electronics and the gearbox with the shifter somehow. I've been fixing the AE86 parts i got from Japan and preparing them for painting for the last few days, today 3Style gave me a hand on sanding the MX5 and then we took the cars to the neighbor's paint shop. I finally decided to respray it, last time anything changed on it was almost a year ago lol. We had less work with the 86 because most of the body was primered a long time ago. That's it for today, see you when the 86 and MX5 return from the paint shop! Wish any modder could build FWD SR20DET, can't wait to see MX5 and AE86 result. Which color will you go for on the AE? # Dr. Zoom : Wish any modder could build FWD SR20DET, can't wait to see MX5 and AE86 result. # radcoon : Which color will you go for on the AE? Yeah, both the 86 and MX5 got back from the paint shop. And they're both red. First i wanted to choose a more subtle color for the 86 but when i was looking at the colors available at the paint shop i'd seen this pretty bright shade of red and just gone for that. I wanted to make the 86 something special so i thought why not make it a bit more flashy haha. I already assembled most of both cars' body parts with the boys in the paint shop but now i'm more focused on the 86 because i wanna get it ready for a drift event which will be next saturday. I looked around online if there are any events like this around Oklahoma and i was quite surprised by how many i found because there aren't many race tracks. On the other hand i was also wondering how i hadn't looked for any events until now! Probably because i don't have a trailer to get the cars there, oops. I'll have to get that sorted out asap! Well that'll have to wait because i'm still working on the 86, first i installed all the parts on it, i also put in this rollcage i got from UpGarage. It's not required for that drift event but it's still useful! Now the only thing left is to tune up the engine, i wanna unleash the full potential of those ITB's so i'll probably need an aftermarket ECU. Now on to the Miata. This one got a special kind of red - it's a Soul Red Crystal Metallic from the current Mazda models. I've seen this color many times on the new CX-3's and CX-5's, well i don't like those but i just love the way that color shines! I think i've seen it on a few ND Miatas too. So i decided to get this color for mine, i've always liked new stuff on old cars! Maybe it doesn't look anything special on the photos here but i can tell you it's just beautiful. See you guys on saturday when i'll take the 86 for some skids. Happy 86 day by the way! Wow , these two look amazing toghether ! I really love the colors you went for ! I can't wait to see you rip that AE ! I really like how this is going ! Thanks mate! Both are great little cars, Miata makes the 86 look quite big though. I can't wait too, i just hope i can sort everything out and make the 86 run like a dream. Colorchoice simply amazing! Special on the miata! Of course the ae looks straight faster in that color! # radcoon : Colorchoice simply amazing! Special on the miata! We all know that red goes faster!! And yeah, it turned out even better on the Miata, i'm still amazed by how it looks. # Lagano : We all know that red goes faster!! And yeah, it turned out even better on the Miata, i'm still amazed by how it looks. Sadly they fade easy from heat. @Zoom - Well maybe the original Miata paint does but not this one! That paint shop knows how to do it properly, they put on all the necessary coats to prevent that. @monkey - Thanks man, i'm really happy with both cars' looks! Off to the drift day we go! This week i was preparing the 86 for today's drift event, most of the work was done on the engine and drivetrain. I got a Link plug in ECU for the 3S-GE which i ordered almost a week ago, it was a special order item so it took a little longer to arrive. When i installed it i took the 86 to a nearby engine tuner to make it run properly with the ITB's. I was quite impressed by the results, 228 HP and 154 ft-lbs! Maybe it's not such a big difference but as you know the Beams is already very well designed, still it looks like the new ECU is doing its job properly. After the engine was tuned up i changed the stock differential to a TRD LSD, i don't think i could drift well with the stock one! I also threw in another Bride seat i got from our shop in case someone will want to go for a ride with me. In the last update i also mentioned that i don't have a trailer or a car to tow it. So i bought a trailer and all the things needed for towing for my 350Z. Not the best idea, right? Well this is my daily, first i thought it would work better with 3Style's E34 but he wanted to keep it clean and i couldn't find a tow hitch for it anyway. This morning everything was ready to go so we drove off straight to Oklahoma City! 3Style took the driver's seat in the 350Z cause i'll mostly drive the 86 anyway haha. 350Z barely towed it but the event is only 100 miles away so we made it. So now we're at the event, lots of drifters and many other cool cars have showed up! I did a few test runs with the 86 too, it runs pretty well but i still have to get the hang of it for some proper drifts. I'll tell you guys more about that when we come back. Stay tuned for some more dorifto pics! DAAAAAAAAAAMNNN. The Hachi's getting some track time, can't wait for the event pics! I can't wait to see her rip ! I never saw someone tow something with a 350z , but I gotta say , that's pretty cool ! I really wish you to have a lot of fun at the track ! I can't wait to see how you shredded the 86 ! Thanks guys! Well the 350Z is reliable but definitely not made for towing, i should get a truck asap. Okay, here we go! So we went to a drift event on saturday as i told you, it was at MacArthur Park Raceway in Oklahoma City, or simply "Mac park" as the locals call it. It was great to drift the 86 for the first time, it was also nice to see so many other drifters just ripping the track! Well, some more than others but most of them were quite skilled. You could see all kinds of rides out there - BMWs, Nissans, Mustangs, Camaros, GT86's, some guy even had a C6 Corvette but he didn't do very well, it just wasn't the right car for a track like this. There was also a little car meet next to the track but with many more cars than anyone expected, someone even showed up in a 1000HP R35! All in all it was a blast, i met some pretty famous drifters from the state which i've seen in some videos, i made a lot of new friends too which i'll definitely see at another event like this. Some drivers really had some "on the limit" moments! This guy did some amazing runs for a pretty much stock E36! This one also reminded me of the drift scene back in Europe where 99% of drift cars are BMWs haha. This one managed to make quite a smoke show, and it was a bone stock GTO! It's hard to handle such a big car on a small track, hats off to this guy. This Supra was familiar to me, i've seen it in some videos and i found out that it attends most of the drift events all around Oklahoma. It was obvious that the driver gained some experience, he managed to pull off some sick drifts! Supra had a lot of steering angle too. Later i noticed that it's an import, i wonder how it's registered. Maybe it's a 93 model but i've seen it in some last year's videos too. This Stang is a frequent participant too, with a very skilled drifter driving it. And here's the most common type of car that was at the event - the 240, first choice for most of the amateur drifters in America. Many of them were LS swapped which is a common thing as well, but this one sounded particularly good and the driver did some impressive drifts! This guy was struggling a bit though. Well a G35 might be a good base for a drift car but definitely not a stock one, in fact there was one 350Z but it had full drift suspension and an LS swap. Most of the 240s looked kinda half-assed to be honest, part street car and part drift car, but this one was obviously purpose built for drifting! Well it has mismatched colors on some parts but it still looked like a proper build. Some of them were also SR20 or RB25 swapped and sounded really nice. This guy was drifting flatout all the time! His car was pretty beaten up so he didn't have to worry about anything. I just love that "ain't care" drifting! This was one of the very few clean looking S13s! Now this one really stood out from the S-chassis crowd. It was a 1JZ! I recognized it from the sound before checking out the car from up close, you can't miss it. This ride has gotten quite famous among Oklahoma's drifters probably because of the looks alone, its owner goes on all the drift events so he got pretty famous too, i've seen his ride in many videos. With a 1JZ and an aggressive bodykit it really reminded me of the hotboi 180 Skip used to have in Japan. Man that was a nice one! After checking out the cars and taking some photos i had a go too. I had the only AE86 at the event, the others had the new ones! I was so satisfied with it, it runs just great and it's perfect for drifting on a small track like this! Maybe i could do with some more power in some corners but it was nothing that a little clutch kick couldn't fix. The engine was tuned just to work well with the ITB's but it still ran perfectly! It needs a fair amount of revs for peak power so it was banging on the limiter quite often. After a few laps i stopped by the track to check the engine and when i popped the hood i got struck by a hot wave of air lol. So i let it cool off for a moment and then kept on ripping. Just before going on the track i put on a Vertex wheel that i snagged from the shop when i was in Japan haha. I wanted to power oversteer in one corner but i was lacking some power in that exact moment so i understeered on the grass lol. AE86 is quite low with this bodykit so i'm glad i didn't scrape anything. Actually i wanted to put on the Do-Luck rear bumper cause i'd be less upset if i smashed that one but it has the exhaust cutout in a different place so that was a no go. Some guy was flying a drone around the track and he managed to make many sick shots along with this one! I found a short video of the event too! *LINK* There were some professional cameramen on the track so i'm sure there will be some more awesome videos later on. This was one of my best weekends i've ever had! I mean, can it get any better than shredding tires, seeing sick rides and meeting new friends? There will be a few more drift events this year so i'm going there for sure! See ya around guys, and keep on drifting! Whoa , these pics are absolutely sick ! I love 'em ! It's so nice to see such a variety of cars at a drift event in the US ! I kinda let off the gas on the whole drift passion that I had , but I'd say that going sideways from time to time isn't that bad ! Seeing a Supra drift is something rare , and to be honest , I wouldn't do that to my Supra , but it sure looks badass ! Anyway , I really enjoyed the pics and I wish I could've been there , but Japan is now my home and I dunno how to feel about leaving it. So , I think you had a ton of fun sliding the 86 ! It looks really good ! Seeing it slide is just really really nice ! I'm really glad you managed to get that thing back to the track after so long ! Bring that 86 back home in Japan and take it to Minami or something ! I can't wait to hang out with you ! The R's meet is gonna be absolutely sick knowing that you'll join us , and I cannot wait to see your R32 ! I bet that thing shreds the road beneath it ! Yeah i was also amazed by that Supra! I definitely had fun haha, haven't had so much fun in a long time! You're so right about the 86, i was so happy to finally enjoy it. See you at the Skyline meet! It would be good to try out the 86 in Japan too, maybe next time. Great footage dude! Looks like a load of fun! That 1Jz looks stunning! As well your AE does! I need to see what's going on on southern next weekend! And Radcoon, if there's a drift event next weekend definitely go check it out! ooooof very nice pics ! Thanks boys! Yeah the 86 did great, and that "technique" worked pretty well in some corners! The Beams was bouncing on the redline like crazy but the track had some tight corners so it wouldn't always work lol, there i could try lift off instead. Thanks mate! It was one of the most fun days i've ever had, that's for sure. Actually the Beams has 228 HP now which is a lot for an AE86 but i'd need some more in certain situations, and in America you can never have enough power haha. R32 hasn't changed until now so i didn't feel like taking any pics of it. However every day i'm in the garage i just stare at it for some time just like i used to look at the GTR converted R32 GTS that Ben had a long long time ago. I might take it for a quick drive in the middle of the night some day to get ready for the meet Anyway see ya in Japan! 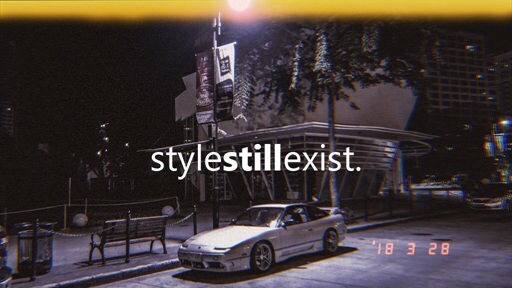 Sadly i could not go to the event, I would have loved to see that AE86 and the rest of the cars skidding, I wish I could go next, I do not want to miss it!